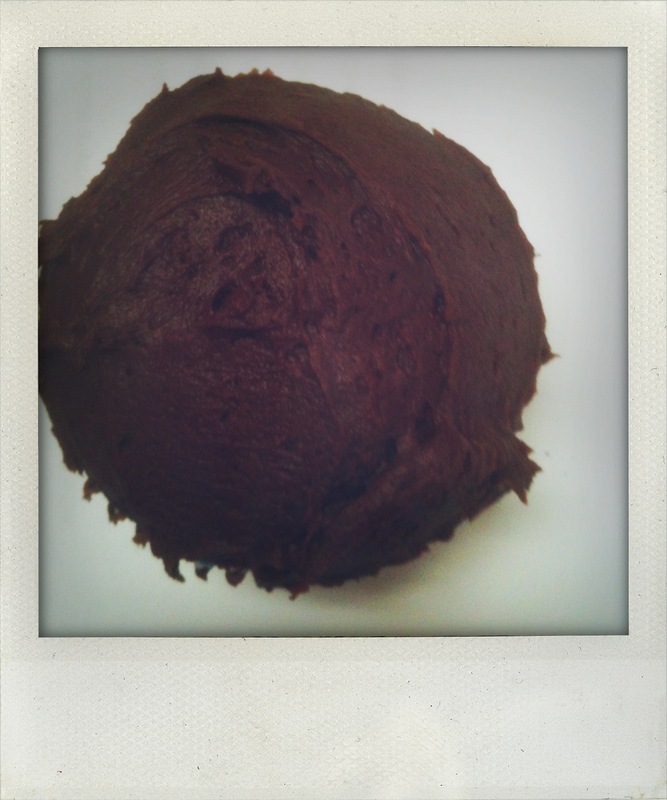 How Can You Be Sad When You’re Eating a Cupcake? A couple of years ago, my bestfriend and I went to Cupcake Camp (essentially an excuse to devour an obsene amount of cupcakes). After we’d chosen the lucky cakes, we plopped ourselves down and dove in. Across the room, we noticed a girl bawling her eyes out. The first thing I thought was, “How can anyone be sad when they’re eating a cupcake?” But we’ve all done it. How many moments have we missed because we’ve been utterly immersed in a problem? I know I’m guilty of it. Whether it was worrying about getting my masters finished, worrying about a fight I had with a friend, worrying about getting behind at work – I know that my worrying interferes with my joy. So what’s a girl to do? I’ve done my fair share of sitting in sadness. But I’ve found letting a little sunshine in diminishes the power a problem has over me. Everytime I’ve taken a step back and accepted the little gifts this world is offering up, I’ve felt better. Because really, how can I be sad when it’s so sunny outside? How can I be sad when I’m soaking in a hot tub? 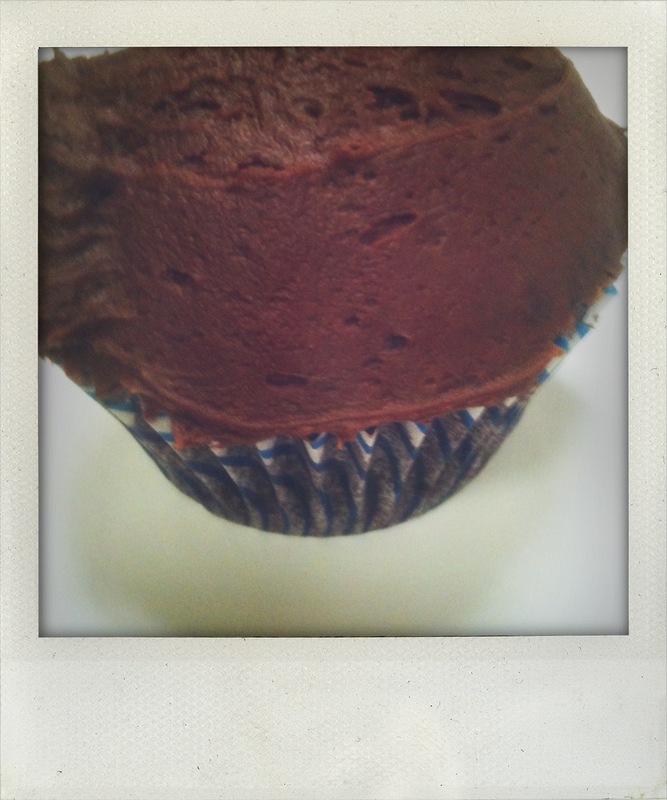 How can I be sad when I’m eating a cupcake? I made these cupcakes this weekend. And you know what? I can think of a couple of people who found a moment of happiness by chowing down on them. Enjoy! Preheat the oven to 350 degrees F. pans. Sift the flour, sugar, cocoa, baking soda, baking powder, and salt into the bowl of an electric mixer fitted with a paddle attachment and mix on low speed until combined. In another bowl, combine the buttermilk, oil, eggs, and vanilla. With the mixer on low speed, slowly add the wet ingredients to the dry. With mixer still on low, add the coffee and stir just to combine, scraping the bottom of the bowl with a rubber spatula. The batter will b incredibly thin! Don’t worry! You didn’t do anything wrong! Pour the batter into muffin cups and bake for 20 minutes, until a cake tester comes out clean. Mix cream cheese and butter until smooth and creamy. Mix in powdered sugar, one cup at a time. Mix in cocoa powder. Spread over cooled cupcakes. Devour! It’s about that time of year when everybody starts feeling a little blah. The weather is blah. Your motivation is blah. And even your wardrobe feels blah – you’re over the chunky knit sweater phase but it’s too cold to wear skirts and ballet flats. What we need is a little somethin’ somethin’ to perk up our spirits. My suggestion? Romance. And I’m not talking about the kind that requires a beau. I think we deserve our own kind of romance, don’t you? Let’s woo our fabulous selves by picking up posies for our abodes, lighting candles, dining out at that cute little bistro around the corner, reading the classics, listening to jazz, taking long hot bubble baths, enjoying a massage for a delicious hour and half, watching a Cary Grant film, savouring a piece of dark chocolate and rocking hot pink lipstick. What do you say? 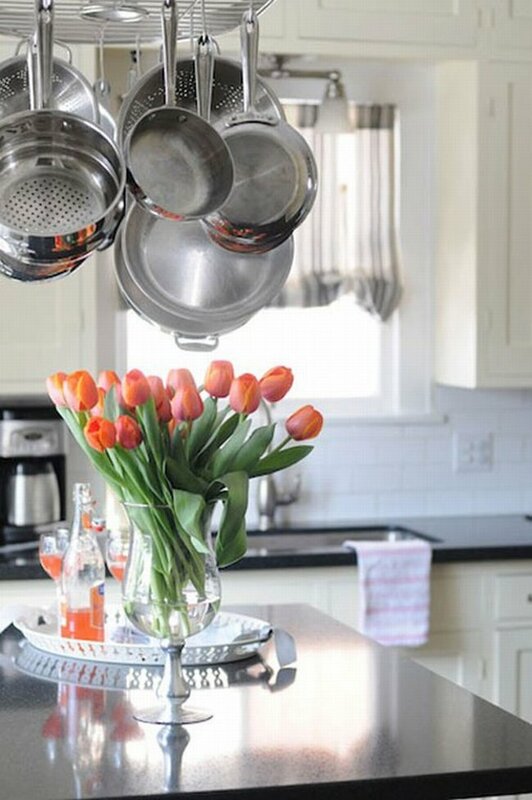 I’ve already booked a massage for this weekend and prettied up my coffee table with pink tulips. 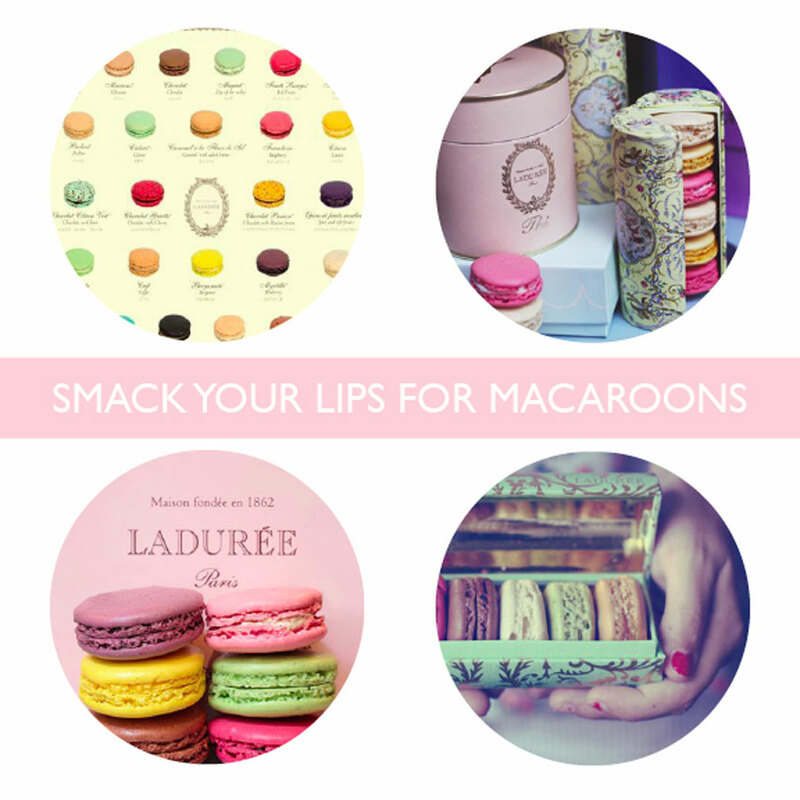 One of these days, I’m going to march into Laduree Paris and order a macaroon or two or six. I’ll probably freak out in a way teenage girls do in reaction to Justin Bieber (minus the crying). I’ll take pictures of the shop, the unimpressed Parisians just trying to get their macaroon fix, and finally myself stuffing my face with the sugary goodness. For that day, the biggest decision I’ll have to make is which colour of macaroon should I eat first. Because really, do you save the prettiest ones for last or not? It could be a great debate. If you’re craving a little Paris at home, you could always try your hand at making the world famous macaroons with the Laduree: The Sweet Recipes Cookbook. Lavender + Chocolate. Could there be a better match? I think not. Except perhaps salt + chocolate. Or lavendar + lemonade. But enough of that. I was doing a little blog homework this morning (it’s tough work perusing through my favourite blogs) and landed on this post by This is Glamorous. If you love pretty things, you’ll die and go to heaven just looking at her blog. 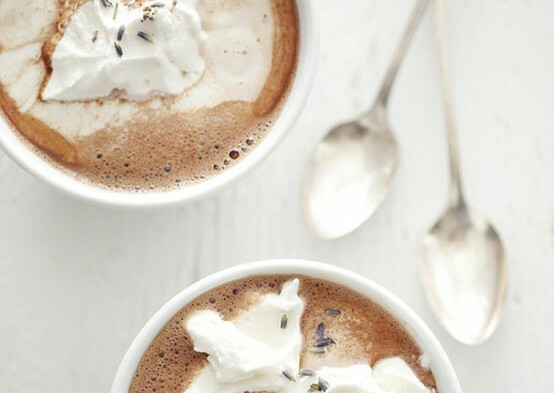 And while you’re there, print off the recipe to Lavender Hot Chocolate. Heaven…I’m in heaven…. 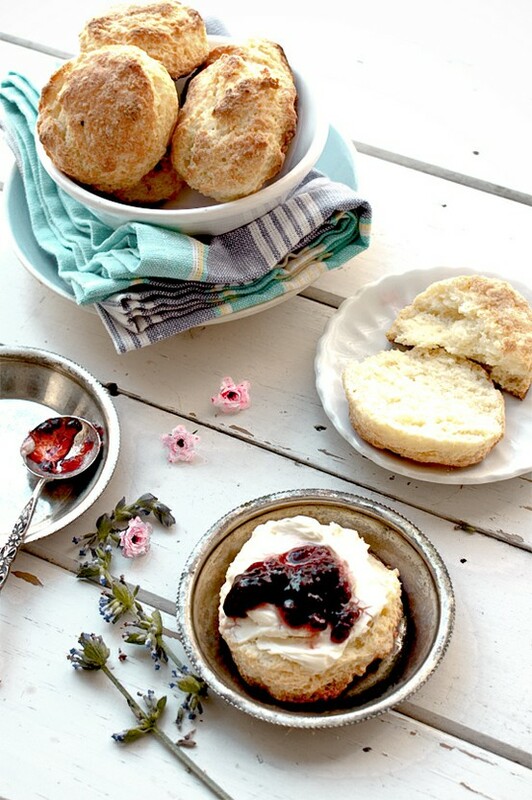 I have a fierce craving for scones with whipped butter and strawberry jam. Fierce. 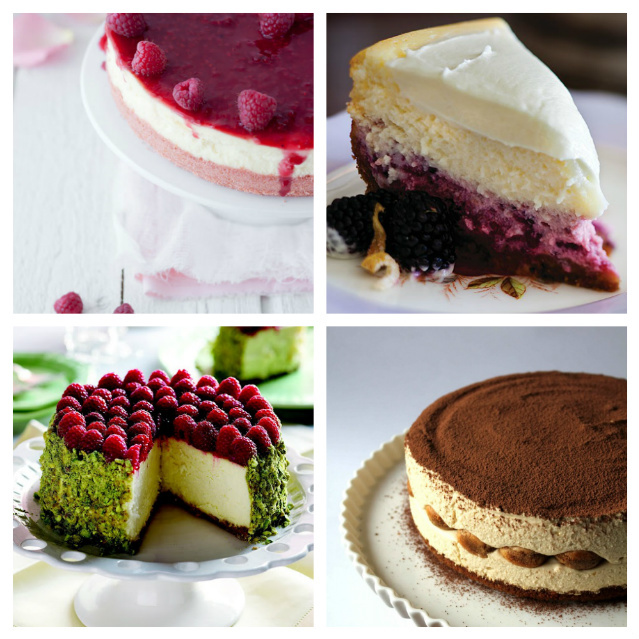 If you want to make these beauties, here’s the recipe. I will just stare and drool from a distance. Le sigh. New amazing blog alert! I basically want to eat every item in the Cozy Kitchen. French toast, smore pudding, heirloom pizza. Yes please. 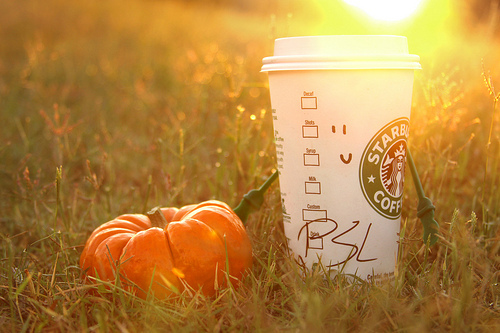 Megan of Limited Supervision sent me the most amazing thing this morning: a recipe for pumpkin spice latte. Sweet goodness! I’m dying to try it out but I’d feel awful keeping a secret like this to myself. 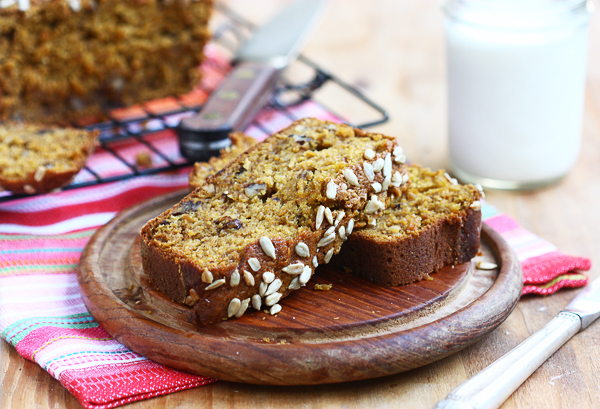 So join me, dear readers, for a cup of pumpkiny goodness. I’m personally picking up all the ingredients tonight. Yummo. What a great idea for an engagement shoot! The smarties over at Styled Creative thought this one up. There’s no end to what you could do with this idea! Spell out numbers for your niece’s birthday, write “Will you marry me?” as a proposal, nosh on “peace” or “joy” on Christmas morning. So very sweet indeed. I want to eat this cake. I don’t want to sit and admire it. I don’t want to take pictures. Somebody already did that. 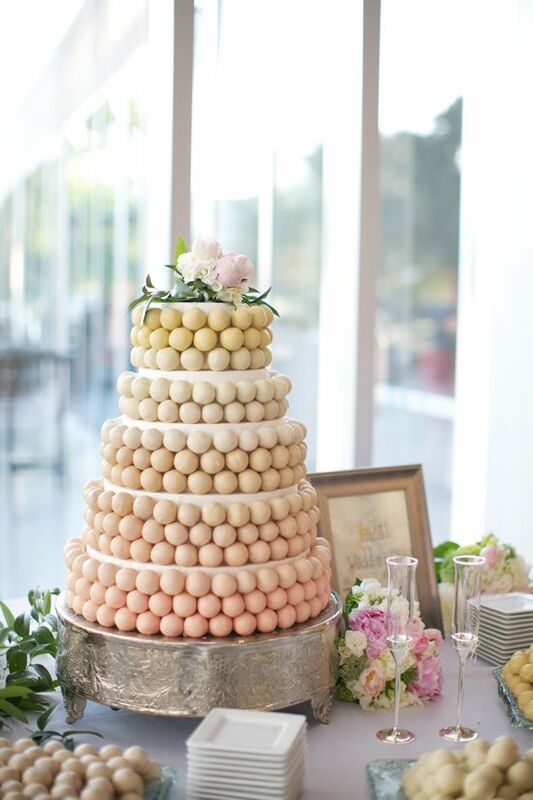 I just want to eat this cake. Immediately. That’s all.